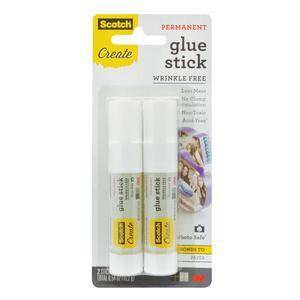 Scotch® Glue Stick with wrinkle-free technology eliminates clumping and wrinkling on most papers, giving your project a more professional, wrinkle-free look. Great for most paper-based craft and scrapbooking projects. ScotchÂ® Glue Stick with wrinkle-free technology eliminates clumping and wrinkling on most papers, giving your project a more professional, wrinkle-free look. Great for most paper-based craft and scrapbooking projects.